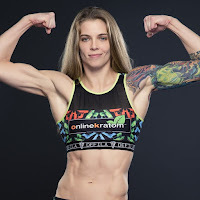 Jessamyn Duke is training at the WWE Performance Center, but she has not made her in-ring debut yet. As noted, Duke tweeted last month that she would make her NXT debut at the same live event in Largo where fellow Four Horsewoman, Marina Shafir, debuted. While Shafir debuted, Duke did not appear on the show. The Wrestling Observer Newsletter noted that Duke is "a little hurt." Although she is injured, Duke recently did a practice match at the WWE Performance Center where she did "good things." It was noted that some believe Duke is a "prodigy" at professional wrestling and that could have gone to change some perception of where WWE needs to look for talent. The feeling is said to be shifting toward accepting a focus on MMA cross-over female talent due to how well people like Ronda Rousey, Duke, Marina Shafir, and Sonya Deville have been able to make a transition into professional wrestling. Plenty of people have praised Ronda Rousey's performances so far as she shot straight to the main roster making her in-ring debut at WrestleMania 34 in a tag team match with Kurt Angle against Triple H and Stephanie McMahon. It was noted that all of Rousey's matches are heavily rehearsed at the WWE Performance Center and that is probably not changing for her SummerSlam match against Alexa Bliss for the Raw Women's Title. Rousey vs. Bliss is expected to be planned out move-for-move while they work out the match at the WWE Performance Center.